Ultimation is launching a new range of retrofit kits to convert gravity roller conveyors to motorized conveyors. The product range fills a growing need to convert existing gravity roller conveyor systems to become motorized systems. The kits enable customers to retain their existing roller conveyor frames and leg supports, while adding new motorized rollers, motor controllers and power supplies. When equipped with photo-eye sensors, the conveyors can move products along the conveyor zone by zone. 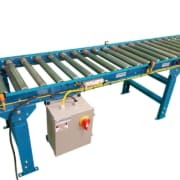 It’s a simple way to convert a roller conveyor to one with motorized rollers. 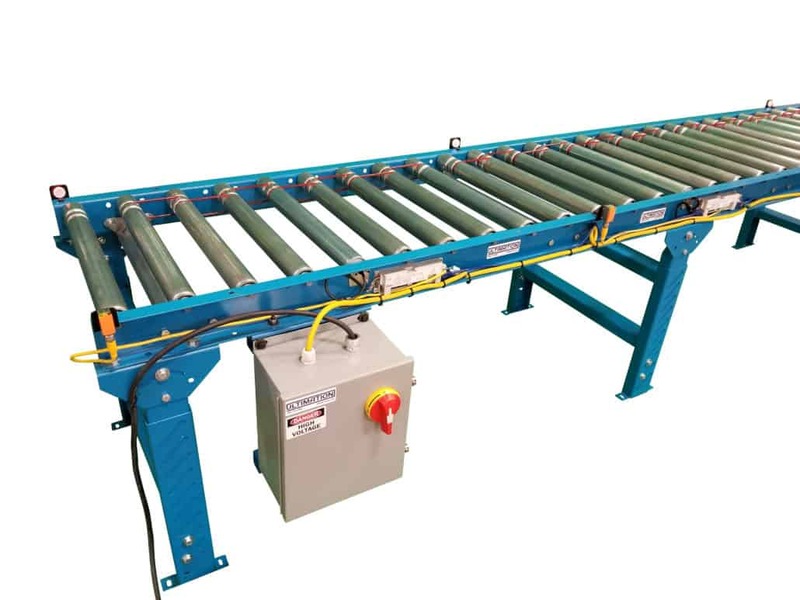 By using one or more motorized rollers per zone, a motorized roller conveyor enables “zero pressure accumulation” (ZPA) movement of parts along a conveyor. In a zero pressure accumulation situation, parts continue moving along the motorized conveyor until they get close to (but do not touch) the product unit in front. Therefore, there are no gaps in the assembly line. The motor driven roller (MDR) conveyor system has its own built in logic cards which automatically manage turning each zone on and off. This reduces programming and commissioning time. Ultimation will customize the kit to include all necessary components for the conveyors. This includes motor driven rollers (MDR), gravity idler rollers, drive belts, motor control cards, cabling and a power supply box. Each power supply box can control up to 5 motorized rollers. The most common motor driven roller that is used is an Itoh Denki PM486FE 24 volt motor roller, but other brands and models are available. “We find that many customers are looking for a simple ‘snap-in’ conversion kit to motorize their existing gravity conveyors said Ultimation’s Operations Manager, Dawn Milot. 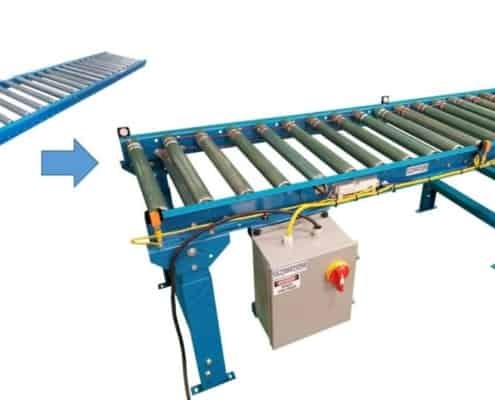 They have a maintenance or engineering team that are able to re-arrange their existing conveyors and implement a motorization process that enables to re-use and upgrade their existing conveyor technology. Our new kits provide new life to old conveyors and allow our customers to better support the demanding ‘just in time’ delivery requirements of today’s marketplace. Unless you have special requirements, we recommend starting with the Itoh Denki PM-486 FE motorized rollers and the HB-510 motor controller cards. The motor control cards can be shipped pre-set with the configuration required as either “start”, “transit” or “end zone”. 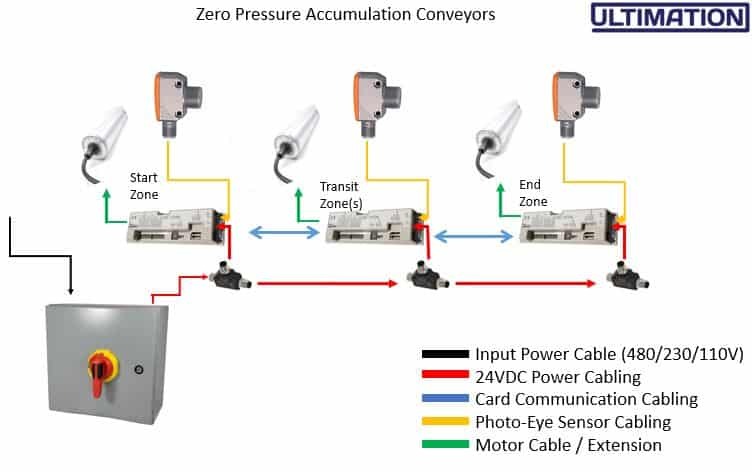 In a start zone, the controller is pre-configured to start the MDR roller running when the photo eye is activated — for example, a carton is placed on the conveyor and the motors begin running. The transit zone motor controllers are configured to accept inputs from the adjacent zones in a handshake manner. When the upstream zone is free, it will send the product forward. When the zone is occupied, it will instruct the downstream zone to hold the product until its own zone is available. No additional PLC or other control is required. The end zone controller is programmed to stop the conveyor when the product reaches the end and activates the photo eye. This can sever to stop the product so it can be unloaded and passed from the conveyor to another line. All three HB-510 cards are identical, but Ultimation will ship them with the necessary settings to they are “plug and play’ on your existing conveyors.